Objective To examine whether the increase in use of electronic cigarettes in the USA, which became noticeable around 2010 and increased dramatically by 2014, was associated with a change in overall smoking cessation rate at the population level. Design Population surveys with nationally representative samples. Setting Five of the US Current Population Survey-Tobacco Use Supplement (CPS-TUS) in 2001-02, 2003, 2006-07, 2010-11, and 2014-15. Participants Data on e-cigarette use were obtained from the total sample of the 2014-15 CPS-TUS (n=161 054). Smoking cessation rates were obtained from those who reported smoking cigarettes 12 months before the survey (n=23 270). Rates from 2014-15 CPS-TUS were then compared with those from 2010-11 CPS-TUS (n=27 280) and those from three other previous surveys. Main outcome measures Rate of attempt to quit cigarette smoking and the rate of successfully quitting smoking, defined as having quit smoking for at least three months. Results Of 161 054 respondents to the 2014-15 survey, 22 548 were current smokers and 2136 recent quitters. Among them, 38.2% of current smokers and 49.3% of recent quitters had tried e-cigarettes, and 11.5% and 19.0% used them currently (every day or some days). E-cigarette users were more likely than non-users to attempt to quit smoking, 65.1% v 40.1% (change=25.0%, 95% confidence interval 23.2% to 26.9%), and more likely to succeed in quitting, 8.2% v 4.8% (3.5%, 2.5% to 4.5%). The overall population cessation rate for 2014-15 was significantly higher than that for 2010-11, 5.6% v 4.5% (1.1%, 0.6% to 1.5%), and higher than those for all other survey years (range 4.3-4.5%). Conclusion The substantial increase in e-cigarette use among US adult smokers was associated with a statistically significant increase in the smoking cessation rate at the population level. These findings need to be weighed carefully in regulatory policy making regarding e-cigarettes and in planning tobacco control interventions. The scientific community is also divided in its opinion of e-cigarettes as a smoking cessation aid. The debate is not as much about the potential efficacy of e-cigarettes for individual users as it is about the overall population impact. A recent Cochrane review suggests that e-cigarettes have a similar effect as nicotine replacement therapy for individual smokers who use them.6 Thus e-cigarettes will have a positive impact on the population cessation rate if they function as a nicotine replacement therapy and if they increase the total proportion of smokers using nicotine replacement products.7891011 Others argue the overall impact of e-cigarettes on smoking in adults will be negative, even if they help some individuals to quit smoking.1213 The reason is that smokers who use e-cigarettes often use them occasionally, along with cigarettes.14 Such dual use could lessen the urgency to quit smoking, delaying the cessation process. If this is true, then the positive effect of e-cigarettes on some will be offset by the negative effect on many others, rendering the overall population impact as negative. A randomized trial at the population level could resolve the debate, but such a trial is difficult to do. Instead, population studies have only compared smokers who have used e-cigarettes with those who have not. Some found that e-cigarette users quit at higher rates915 whereas others found the opposite.161718 None has reported whether the overall population cessation rate (which includes both e-cigarette users and non-users) has changed because of e-cigarettes. We examined the relation between e-cigarette use and smoking cessation in the US population using the largest representative sample of smokers and e-cigarette users available to date: the 2014-15 Current Population Survey-Tobacco Use Supplement (CPS-TUS). Population surveys in the US began to measure e-cigarette use around 2010.14 The surveys found that most users were smokers. In 2010, about 1.4% of smokers were current users of e-cigarettes.19 Their usage among smokers increased dramatically by 2014, with estimates from various studies ranging from 15% to 30%.14192021 Thus a comparison between CPS-TUS 2010-11 and 2014-15 provides the best chance yet to examine the effect of e-cigarettes on the overall smoking cessation rate. We investigated two questions: First, did users of e-cigarettes in 2014-15 quit smoking at a higher rate than non-users? Second, did smokers in 2014-15 as a whole quit smoking at a higher rate than those in 2010-11? For a longer historical view, we also compared the 2014-15 survey with surveys earlier than 2010-11. The US Current Population Survey-Tobacco Use Supplement (CPS-TUS) is a periodic tobacco survey attached to the Current Population Survey and administered by the US Census Bureau. It provides data from a nationally representative sample of US households of non-institutionalized civilians. Details of the design are published elsewhere.22 Our analysis included five surveys, 2001-02, 2003, 2006-07, 2010-11, and 2014-15. The sample sizes (excluding proxy respondents) were 185 568, 183 810, 172 023, 171 365, and 163 920, respectively. We did not include surveys earlier than 2001-02 because they did not assess quit attempts for all smokers. For analysis of the prevalence of e-cigarette use in the 2014-15 survey, we included 161 054 of the total sample of 163 920 (we excluded those who did not answer questions on cigarettes or e-cigarettes). The analysis on smoking cessation included respondents aged 18 or older and who answered “every day” or “some days” to the question: “Around this time 12 months ago, were you smoking cigarettes every day, some days, or not at all?” Sample sizes for the five surveys for this analysis were 38 999, 34 440, 31 497, 27 280, and 23 270, respectively. The rapidly declining sample size of eligible smokers over the years (as opposed to the change in total sample sizes for the surveys shown in the previous section) was largely a result of declining smoking prevalence over time. The smoking prevalence based on these surveys was, 21.0%, 18.9%, 18.5%, 16.1%, and 13.7%, for 2001-02, 2003, 2006-07, 2010-11, and 2014-15, respectively. Current users of e-cigarettes were ever users who answered “every day” or “some days” to the question: “Do you now use an e-cigarette every day, some days, or not at all?” Those who answered “not at all” were asked when they stopped using e-cigarettes. The “use of e-cigarettes” included any use within the past 12 months: those who reported currently using at the time of survey and those who reported using in the past 12 months but who had stopped by the time of survey. Table 1⇓ shows the rates of ever use and current use of e-cigarettes in the 2014-15 survey by demographics. Overall, 8.5% of US adults (n=161 054) had ever tried e-cigarettes and 2.4% were currently using them. Men were more likely to use e-cigarettes than women, and younger groups were more likely than older groups. The prevalence also differed by ethnicity and education. Table 2⇓ shows e-cigarette use by cigarette smoking status. Of 161 054 respondents to the 2014-15 survey, 104 788 were never smokers, 22 548 were current smokers, and 2136 recent quitters (those who quit for less than one year). Never smokers had the lowest rate for e-cigarette use: 2.0% had ever used them. Recent quitters had the highest ever use rate, 49.3%, which was even higher than that of current smokers, 38.2%. Table 2⇑ also shows the distribution of these ever e-cigarette users by subgroups. Overall, 28.0% of ever users (n=13 042) were current users; the rest had stopped. About 22.8% stopped within the year before the survey, 22.1% stopped for one year or more, and 27.2% gave no date. Again, recent quitters (n=984) were most likely to have continued using e-cigarettes, 38.7%. If they had stopped e-cigarettes, they also were most likely to have only stopped within a year, 30.4%. Longer term former smokers had stopped e-cigarettes for a longer period. The more time since quitting smoking, the less likely respondents were to give a stopping date for e-cigarettes. Table 3⇓ shows the prevalence of current e-cigarette use. Only 0.3% of never smokers currently used e-cigarettes at the time of survey. Again, recent quitters had the highest prevalence, 19.0%, even higher than that of current smokers, 11.5%. Table 3⇑ also shows the distribution of these current users of e-cigarettes by subgroups. Overall, 33.7% of them were daily users. Former smokers were more likely than current smokers to be daily users, with the highest proportion, 72.7%, in recent quitters. Figure 1 compares those who had used e-cigarettes within one year with those who had not. The within-one-year users included those who reported currently using e-cigarettes at the time of survey and those who reported using e-cigarettes within the past 12 months but had stopped by the time of survey. The top panel of figure 1 shows that within-one-year users were more likely to have made an attempt to quit smoking in the previous 12 months than all the other three subgroups: ever users who had stopped e-cigarettes for one year or more, ever users who stopped e-cigarettes but did not give dates, and never users. The attempt rates were 65.1%, 48.4%, 48.8%, and 37.8%, respectively. The bottom panel of figure 1 shows the annual cessation rate for these four subgroups. The cessation rates follow the pattern of quit attempts: 8.2%, 5.4%, 5.3%, and 4.6%, respectively. Figure 2 compares the results of 2014-15 with those of 2010-11, and with the three other surveys. The top panel shows that the overall quit attempt rate changed little until 2014-15: 40.3%, 40.5%, 39.9%, 41.4%, and 45.9%, respectively. Using the 2001-02 survey as a reference, the 2010-11 and 2014-15 surveys had statistically higher quit attempt rates (P<0.05 and P<0.001). The attempt rate in the 2014-15 survey was noticeably higher. For ease of comparison, we combined the results for the three groups that did not use e-cigarettes in the past year (see fig 1) into one group (fig 2). The last two bars show that quit attempts for smokers who did not use e-cigarettes within one year (40.1%) were similar to those in previous surveys. Quit attempts for e-cigarette users were, however, statistically significantly higher than for non-users., Numerically speaking, it was this e-cigarette user subgroup that raised the overall quit attempt rate for 2014-15, and thus the rate was statistically significantly higher than in all previous survey years. 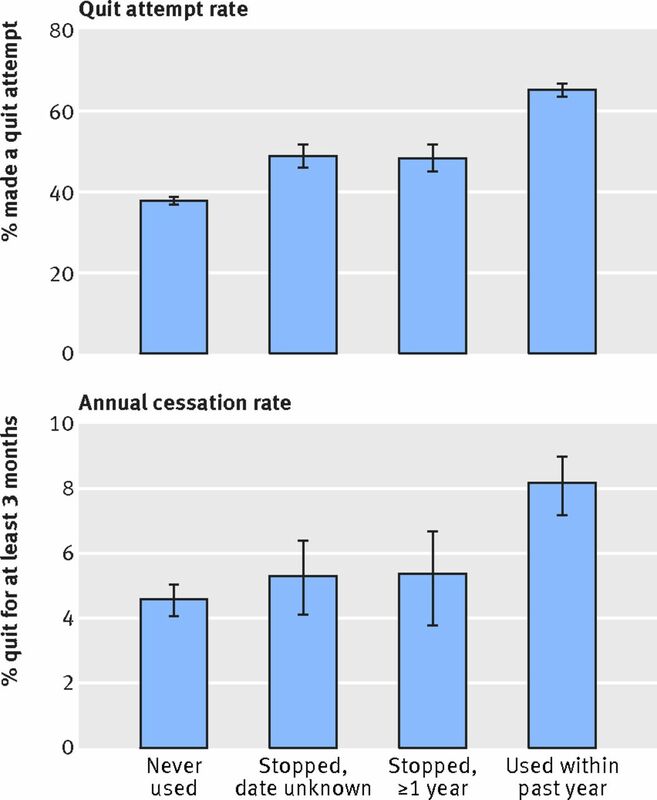 The bottom panel of figure 2 shows the annual cessation rate, which follows the pattern of the quit attempt rate. The annual cessation rates did not change much until 2014-15: 4.3%, 4.3%, 4.5%, 4.5%, and 5.6% for 2001-02, 2003, 2006-07, 2010-11, and 2014-15, respectively. Using 2001-02 as a reference, only 2014-15 had a statistically higher overall cessation rate (P<0.001). Compared with 2010-11, 2014-15 had a statistically significantly higher cessation rate, 5.6% v 4.5% (change=1.1%, 95% confidence interval 0.6% to 1.5%). Again, the 2014-15 survey had a noticeably higher overall cessation rate because the e-cigarette user subgroup had a higher cessation rate than those who did not report e-cigarette use in the past year (8.2% v 4.8%, respectively, (P<0.001). The absolute difference of 3.5% (rounded from 3.48) translates into a 73% relative increase. This study has two principal findings. First, in 2014-15, e-cigarette users in the United States attempted to quit cigarette smoking and succeeded in quitting at higher rates than non-users. Second, the overall population smoking cessation rate in 2014-15 increased statistically significantly from that in 2010-11. The 1.1 percentage point increase in cessation rate (from 4.5% to 5.6%) might appear small, but it represents approximately 350 000 additional US smokers who quit in 2014-15. The main strength of our study is that we used the largest representative sample of e-cigarette users among the US population. Moreover, by using the ongoing US Current Population Surveys, we evaluated the impact of e-cigarettes in a larger context through comparing the quit rate in 2014-15 with that of the same population survey from previous years. This provides the clearest result to date that e-cigarette use is not only associated with a higher smoking cessation rate at the individual user level but also at the population level. Our study has limitations common to population surveys. Self report is subject to recall biases. Survey questions were limited, preventing more detailed analysis of the quitting process. For example, the lack of information on pharmacotherapy use in this survey prevents comparisons between e-cigarette users and those who use traditional pharmacotherapy. Though another national survey in 2014 found that more smokers in the US used e-cigarettes than FDA approved pharmacotherapy,34 similar to results from England,11 the inability to compare these two subgroups in the present survey is a limitation. Also, lack of information on the type of e-cigarette product used (ie, open versus closed system) limits further comparison to other population studies of e-cigarettes that might have been informative. Another limitation is that this study is not a randomized trial at the population level. Thus it is important to examine other possible influences on the population smoking cessation rate. We discuss two major interventions that occurred at the national level and took place around the 2010-11 and 2014-15 surveys. First, in 2009 there was an increase in federal tobacco tax.35 The national cigarette tax increased by 158%, resulting in an immediate reduction in cigarette uptake among US adolescents.35 In our study we found a small but statistically significant increase in quit attempts among US adults, from 39.9% in 2006-07 to 41.4% in 2010-11 (fig 2, top panel). However, the total cessation rate did not change: 4.5% for both surveys (fig 2, bottom panel). Thus the effect of the 2009 federal tax on quitting by adult smokers, if there was an immediate one, was no longer detectable by 2010-11. This lack of change in smoking cessation under such a dramatic tax increase accentuates the difficulty in improving quit rates at the population level.23 It does provide a reference point to evaluate the magnitude of change reported for the 2014-15 US Current Population Survey-Tobacco Use Supplement (CPS-TUS). Could TIPS alone explain the increase? Given the reach of the first TIPS campaign, after four rounds it was expected to reach most US smokers by 2014-15.3637 However, the majority of smokers did not appear to change their quitting behavior: smokers who did not use e-cigarettes were the majority (77%) in 2014-15. Neither their attempt rate nor the annual cessation rate was statistically different from that of all smokers in 2010-11 (fig 1). It was e-cigarette users in 2014-15 who showed a dramatically higher quit attempt rate and a higher cessation rate. Thus it would be unlikely that the TIPS campaign was solely responsible for the overall increase because that would mean the TIPS messages only resonated with those who happened to use e-cigarettes in 2014-15. Given that the e-cigarette user subgroup was the only group that had statistically significantly higher rates in 2014-15 (fig 2), it is tempting to attribute the increase in the overall smoking cessation rate in 2014-15 solely to e-cigarette use. However, e-cigarette use itself could be an indicator of motivation to quit smoking, which would predict a higher quit rate.34 Thus, attributing the full 73% relative difference to e-cigarettes is likely an overestimate of their effect. What is more probable is that e-cigarettes and tobacco control measures, such as the TIPS campaign and other state level activities for tobacco control, worked synergistically to produce the first substantial increase in population cessation in the US in the past 15 years (fig 2): tobacco control campaigns increased smokers’ desire to quit, and e-cigarettes increased the probability of motivated smokers making a quit attempt and staying abstinent. Viewed from the context of an earlier analysis that examined the US population data from 1991 onward,23 this is the first time in almost a quarter of a century that the smoking cessation rate in the US has increased at the population level. First, as e-cigarettes grew more popular over time, more people used them intensively.14 This study found that 33.7% of current e-cigarette users were daily users. Earlier studies rarely reported on intensity of usage.13 Many did not report if e-cigarettes were used within the past 12 months, but only identified the users as ever users.13 Intensive use of e-cigarettes is key to their potential effect as a smoking cessation aid.141534 Our study, based on the largest representative sample of e-cigarette users in the US in 2014-15, found that more than 70% of recent quitters who used e-cigarettes were still using e-cigarettes daily. The daily use might have been critical in preventing relapse. Second, e-cigarette products have evolved, and open system devices have become more popular.39 Open systems generally deliver a greater concentration of nicotine and engender a higher level of perceived control than do closed systems.3940 The use of open systems was associated with higher smoking cessation rates.404142 Thus if the proportion of open system users increases, it may lead to higher quit rates for all e-cigarette users. A more important finding from this study that differs from previous studies is that the increased smoking cessation rate among e-cigarette users translated into a higher overall population cessation rate in 2014-15, compared with 2010-11. If the overall population cessation rate did not increase in 2014-15, then the meaning of the subgroup difference between e-cigarette users and non-users would be less clear. The use of e-cigarettes was not a randomly assigned condition but rather self selected by smokers. Such a self selection process could result in no change in the overall population rate, even if there are subgroups differences. In fact, one of the most vexing results in the smoking cessation literature is that the population cessation rate in the US has shown no discernible trend from 1991 to 2010, even though an increasing proportion of smokers used proven pharmacotherapy.23 During the two decades before 2011, the annual cessation rate hovered around 4.4%.23 Our study replicated this finding in the first four CPS-TUSs in the 21st century. From 2001-02 to 2010-11, the cessation rate ranged from 4.3% to 4.5%. It was in 2014-15 CPS-TUS, where we found the first statistically significant increase in the population cessation rate (fig 2). With an increase in the overall population cessation rate as context, the subgroup difference between e-cigarette users and non-users found in this study takes on more importance. The cessation rate for those who did not use e-cigarettes in 2014-15 CPS-TUS remained statistically indistinguishable from those of the previous years (see fig 2). It was the e-cigarette users who quit at a clearly higher rate (8.2%) that brought the overall population cessation rate to a higher level. Such a data pattern makes it more reasonable to conclude that e-cigarette use contributes to the increase in the overall smoking cessation rate. Our study replicates other US studies on the ethnic representation of e-cigarette use.1920 E-cigarette use is observed across all ethnic groups, but rates are higher for some groups.1920 Our study focuses its analysis on the overall population effect of e-cigarette on smoking cessation in adults in the US context. Future studies might examine the e-cigarette effect by demographic subgroups. The main results, based on the diverse US population, suggest a similar effect may be observed in other jurisdictions if a sufficient proportion of smokers use e-cigarettes on a daily basis as aids to quit smoking. We thank Jessica Sun for her comments on earlier drafts of the paper and for her help in preparing the manuscript. Contributors: S-HZ and Y-LZ conceived the study. Y-LZ, S-HZ, and SW analyzed the data. S-HZ, Y-LZ, SW, SEC, and GJT interpreted the data. S-HZ, Y-LZ, SEC, GJT, and SW helped draft the manuscript. All authors had full access to all of the data in the study and take responsibility for the integrity of the data and the accuracy of the data analysis. S-HZ is guarantor for the study. Funding: This study was supported by the National Cancer Institute of the National Institutes of Health under the State and Community Tobacco Control (SCTC) Initiative (award No U01CA154280). The content is solely the responsibility of the authors and does not necessarily represent the official views of the National Institutes of Health. Funders of this study had no role in the study design; collection, analysis, and interpretation of the data; writing of the manuscript; or decision to submit the manuscript for publication. Competing interests: All authors have completed the ICMJE uniform disclosure form at www.icmje.org/coi_disclosure.pdf and declare: S-HZ has received a grant from the National Institutes of Health for this work. All authors declare no financial relationships with any organizations that might have an interest in the submitted work in the previous three years; and no other relationships or activities exist that could appear to have influenced the submitted work. Ethical approval: This study is a secondary data analysis of publicly available data, approved by the UCSD Human Research Protection Program (institutional review board No 140821). Data sharing: The full dataset is publicly available from the US Census Bureau. Transparency: The lead author (S-HZ) affirms that the manuscript is an honest, accurate, and transparent account of the study being reported; that no important aspects of the study have been omitted; and that any discrepancies from the study as planned have been explained. Medicines and Healthcare Products Regulatory Agency. Licensing Procedure for Electronic Cigarettes and Other Nicotine Containing Products (NCPs) as Medicines. https://www.gov.uk/government/uploads/system/uploads/attachment_data/file/595533/Licensing_procedure_for_electronic_cigarettes_and_other_nicotine_contain_products_as_medicines.pdf. Published 2017. Accessed July 7, 2017. Douglas H, Hall W, Gartner C. E-cigarettes and the law in Australia. Aust Fam Physician2015;358:415-8.pmid:26209995. Zhu S-H, Sun JY, Bonnevie E, et al. Four hundred and sixty brands of e-cigarettes and counting: implications for product regulation. Tob Control2014;358(Suppl 3):iii3-9. doi:10.1136/tobaccocontrol-2014-051670. pmid:24935895. Ramamurthi D, Gall PA, Ayoub N, Jackler RK. Leading-brand advertisement of quitting smoking benefits for e-cigarettes. Am J Public Health2016;358:2057-63. doi:10.2105/AJPH.2016.303437. pmid:27631743. Food and Drug Administration, HHS. Deeming Tobacco Products To Be Subject to the Federal Food, Drug, and Cosmetic Act, as Amended by the Family Smoking Prevention and Tobacco Control Act; Restrictions on the Sale and Distribution of Tobacco Products and Required Warning Statements for Tobacco Products. Final rule. Fed Regist2016;358:28973-9106.pmid:27192730. Hartmann-Boyce J, McRobbie H, Bullen C, Begh R, Stead LF, Hajek P. Electronic cigarettes for smoking cessation. In: Cochrane Database of Systematic Reviews. John Wiley & Sons, Ltd, 2016, http://onlinelibrary.wiley.com/doi/10.1002/14651858.CD010216.pub3/abstract, Accessed September 14, 2016 doi:10.1002/14651858.CD010216.pub3. Levy DT, Cummings KM, Villanti AC, et al. A framework for evaluating the public health impact of e-cigarettes and other vaporized nicotine products. Addiction2017;358:8-17. doi:10.1111/add.13394. pmid:27109256. Etter J-F. E-cigarettes: methodological and ideological issues and research priorities. BMC Med2015;358:32. doi:10.1186/s12916-014-0264-5. pmid:25856794. Brown J, Beard E, Kotz D, Michie S, West R. Real-world effectiveness of e-cigarettes when used to aid smoking cessation: a cross-sectional population study. Addiction2014;358:1531-40. doi:10.1111/add.12623. pmid:24846453. Farsalinos KE, Poulas K, Voudris V, Le Houezec J. Electronic cigarette use in the European Union: analysis of a representative sample of 27 460 Europeans from 28 countries. Addiction2016;358:2032-40. doi:10.1111/add.13506. pmid:27338716. Beard E, West R, Michie S, Brown J. Association between electronic cigarette use and changes in quit attempts, success of quit attempts, use of smoking cessation pharmacotherapy, and use of stop smoking services in England: time series analysis of population trends. BMJ2016;358:i4645. doi:10.1136/bmj.i4645. pmid:27624188. Chapman S. E-cigarettes: the best and the worst case scenarios for public health-an essay by Simon Chapman. BMJ2014;358:g5512. doi:10.1136/bmj.g5512. pmid:25204397. Kalkhoran S, Glantz SA. E-cigarettes and smoking cessation in real-world and clinical settings: a systematic review and meta-analysis. Lancet Respir Med2016;358:116-28. doi:10.1016/S2213-2600(15)00521-4. pmid:26776875. Glasser AM, Collins L, Pearson JL, et al. Overview of electronic nicotine delivery systems: a systematic review. Am J Prev Med2017;358:e33-66. doi:10.1016/j.amepre.2016.10.036. pmid:27914771. Biener L, Hargraves JL. A longitudinal study of electronic cigarette use among a population-based sample of adult smokers: association with smoking cessation and motivation to quit. Nicotine Tob Res2015;358:127-33. doi:10.1093/ntr/ntu200. pmid:25301815. Christensen T, Welsh E, Faseru B. Profile of e-cigarette use and its relationship with cigarette quit attempts and abstinence in Kansas adults. Prev Med2014;358:90-4. doi:10.1016/j.ypmed.2014.09.005. pmid:25230365. Al-Delaimy WK, Myers MG, Leas EC, Strong DR, Hofstetter CR. E-cigarette use in the past and quitting behavior in the future: a population-based study. Am J Public Health2015;358:1213-9. doi:10.2105/AJPH.2014.302482. pmid:25880947. Shi Y, Pierce JP, White M, et al. E-cigarette use and smoking reduction or cessation in the 2010/2011 TUS-CPS longitudinal cohort. BMC Public Health2016;358:1105. doi:10.1186/s12889-016-3770-x. pmid:27769302. McMillen RC, Gottlieb MA, Shaefer RMW, Winickoff JP, Klein JD. Trends in electronic cigarette use among U.S. adults: use is increasing in both smokers and nonsmokers. Nicotine Tob Res2015;358:1195-202. doi:10.1093/ntr/ntu213. pmid:25381306. Delnevo CD, Giovenco DP, Steinberg MB, et al. Patterns of electronic cigarette use among adults in the United States. Nicotine Tob Res2016;358:715-9. doi:10.1093/ntr/ntv237. pmid:26525063. Schoenborn CA, Gindi RM. Electronic cigarette use among adults: United States, 2014. NCHS Data Brief2015;358:1-8.pmid:26555932. United States Census Bureau, National Cancer Institute, Food and Drug Administration. Tobacco Use Supplement to the Current Population Survey (TUS-CPS). https://cancercontrol.cancer.gov/brp/tcrb/tus-cps/. Published 2016. Accessed December 9, 2016. Zhu S-H, Lee M, Zhuang Y-L, Gamst A, Wolfson T. Interventions to increase smoking cessation at the population level: how much progress has been made in the last two decades?Tob Control2012;358:110-8. doi:10.1136/tobaccocontrol-2011-050371. pmid:22345233. Gilpin EA, Pierce JP, Farkas AJ. Duration of smoking abstinence and success in quitting. J Natl Cancer Inst1997;358:572-6. doi:10.1093/jnci/89.8.572 pmid:9106646. Pierce JP, Gilpin EA. Impact of over-the-counter sales on effectiveness of pharmaceutical aids for smoking cessation. JAMA2002;358:1260-4. doi:10.1001/jama.288.10.1260. pmid:12215133. Zhu S-H, Cummins SE, Gamst AC, Wong S, Ikeda T. Quitting smoking before and after varenicline: a population study based on two representative samples of US smokers. Tob Control2016;358:464-9. doi:10.1136/tobaccocontrol-2015-052332. pmid:26283713. Davis WW, Hartman AM, Gibson JT. Trends in smoking prevalence by race based on the Tobacco Use Supplement to the Current Population Survey. https://s3.amazonaws.com/sitesusa/wp-content/uploads/sites/242/2014/05/2007FCSM_Davis-VII-C.pdf. Published 2015. Accessed July 3, 2017. US Department of Commerce. Census Bureau. National Cancer Institute and Centers for Disease Control and Prevention Co-sponsored Tobacco Use Supplement to the Current Population Survey (2001-2002). Technical Documentation. https://www.census.gov/programs-surveys/cps/technical-documentation/complete.html. Published 2004. Accessed July 3, 2017. US Department of Commerce. Census Bureau. National Cancer Institute and Centers for Disease Control and Prevention Co-sponsored Tobacco Use Special Cessation Supplement to the Current Population Survey (2003). Technical Documentation. https://cancercontrol.cancer.gov/brp/tcrb/tus-cps/info.html. Published 2006. Accessed July 3, 2017. US Department of Commerce. Census Bureau. National Cancer Institute and Centers for Disease Control and Prevention Co-sponsored Tobacco Use Supplement to the Current Population Survey (2006-07). Technical Documentation. https://cancercontrol.cancer.gov/brp/tcrb/tus-cps/citation.html. Published 2008. Accessed July 3, 2017. US Department of Commerce. Census Bureau. National Cancer Institute-sponsored Tobacco Use Supplement to the Current Population Survey (2010-11) Technical Documentation. https://www.census.gov/programs-surveys/cps/technical-documentation/complete.html. Published 2012. Accessed July 3, 2017. US Department of Commerce. Census Bureau. National Cancer Institute and Food and Drug Administration co-sponsored Tobacco Use Supplement to the Current Population (2014-15). Technical Documentation. https://www.census.gov/programs-surveys/cps/technical-documentation/complete.html. Published 2016. Accessed July 3, 2017. Research Triangle Institute. Release 11.358, Research Triangle Park, NC, Research Triangle Institute, 2012. (SUDAAN Language Manual.). Zhuang Y-L, Cummins SE, Y Sun J, Zhu S-H. Long-term e-cigarette use and smoking cessation: a longitudinal study with US population. Tob Control2016;358(Suppl 1):i90-5. doi:10.1136/tobaccocontrol-2016-053096. pmid:27697953. Huang J, Chaloupka FJ. The Impact of the 2009 Federal Tobacco Excise Tax Increase on Youth Tobacco Use. NBER Working Paper No. 18026. National Bureau of Economic Research; 2012. http://www.nber.org/papers/w18026. Accessed December 16, 2016. Neff LJ, Patel D, Davis K, Ridgeway W, Shafer P, Cox S. Evaluation of the national Tips From Former Smokers campaign: the 2014 longitudinal cohort. Prev Chronic Dis2016;358:E42. doi:10.5888/pcd13.150556. pmid:27010845. McAfee T, Davis KC, Alexander RL Jr, , Pechacek TF, Bunnell R. Effect of the first federally funded US antismoking national media campaign. Lancet2013;358:2003-11. doi:10.1016/S0140-6736(13)61686-4. pmid:24029166. Pearson JL, Stanton CA, Cha S, Niaura RS, Luta G, Graham AL. E-Cigarettes and Smoking Cessation: Insights and Cautions From a Secondary Analysis of Data From a Study of Online Treatment-Seeking Smokers. Nicotine Tob Res2015;358:1219-27. doi:10.1093/ntr/ntu269. pmid:25542911. Farsalinos KE, Spyrou A, Tsimopoulou K, Stefopoulos C, Romagna G, Voudris V. Nicotine absorption from electronic cigarette use: comparison between first and new-generation devices. Sci Rep2014;358:4133. doi:10.1038/srep04133. pmid:24569565. Hitchman SC, Brose LS, Brown J, Robson D, McNeill A. Associations between e-cigarette type, frequency of use, and quitting smoking: findings from a longitudinal online panel survey in Great Britain. Nicotine Tob Res2015;358:1187-94. doi:10.1093/ntr/ntv078. pmid:25896067. Chen C, Zhuang Y-L, Zhu S-H. E-cigarette design preference and smoking cessation: a U.S. population study. Am J Prev Med2016;358:356-63. doi:10.1016/j.amepre.2016.02.002. pmid:27005984. Malas M, van der Tempel J, Schwartz R, et al. Electronic Cigarettes for Smoking Cessation: A Systematic Review. Nicotine Tob Res2016;358:1926-36. doi:10.1093/ntr/ntw119. pmid:27113014. West R, DiMarino ME, Gitchell J, McNeill A. Impact of UK policy initiatives on use of medicines to aid smoking cessation. Tob Control2005;358:166-71. doi:10.1136/tc.2004.008649. pmid:15923466. Shiffman S, Gitchell J, Pinney JM, Burton SL,, Kemper KE,, Lara EA. Public health benefit of over-the-counter nicotine medications. Tob Control1997;358:306-10. doi:10.1136/tc.6.4.306. pmid:28340053. Yong H-H, Hitchman SC, Cummings KM, et al. Does the regulatory environment for e-cigarettes influence the effectiveness of e-cigarettes for smoking cessation? : Longitudinal findings from the ITC Four Country Survey. Nicotine Tob Res2017; [Published online 4 March.]. doi:10.1093/ntr/ntx056. pmid:28340053.